Summer is over, you guys. Here in the Northwest, we’ve got that wonderful, crisp-aired morning thing going on, which I just love. Nights have cooled down to the comfortable sleeping temperatures dreamed of all hot summer long, and days are bright and pleasant – good for being outside. This weekend I weeded with the sound of leaves skittering down the street accompanying the other gardening sounds, i.e. my favorite talk radio podcast and a few bending-over grunts. It’s an exceptionally pleasant time of year. A couple of weeks ago, we pulled up the tomato plants. It was perhaps a little hasty, but it did seem like a good time to get the raised beds ready for winter, with cover crops in some (I plan to use fava beans this year, so we can eat them in early spring with a nice Chianti) and winter garden seeds in others (we replanted lettuce and peas – we’ll see – and collards, mustards, and carrots). 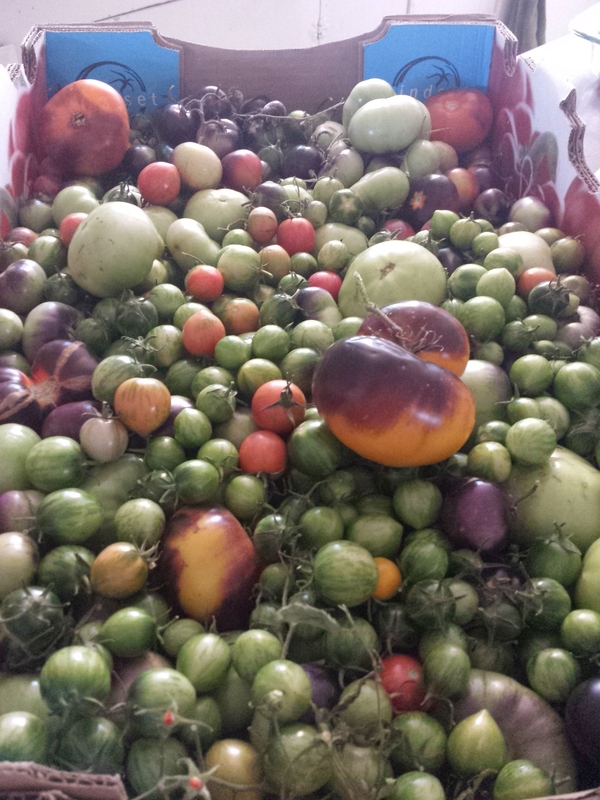 The plants were waning, but gave us many pounds of ripe tomatoes, and many, many more pounds of green ones. Over the last couple of years, I have learned how to ripen green tomatoes indoors, and it is SO. EASY. Put them in a wide, flat box. Those are the instructions. Tomatoes will ripen indoors without much help at all, people. 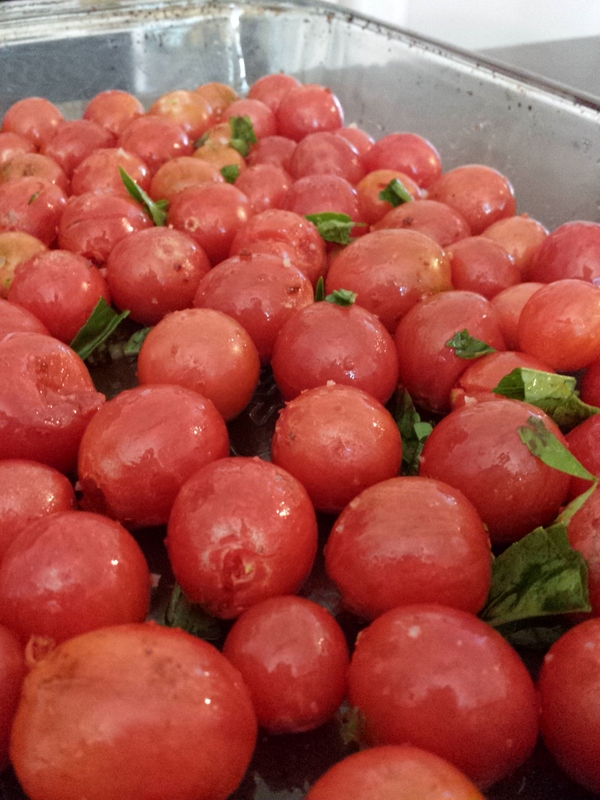 Every few days, I have been picking through the box and gathering at least a 9×13″ dish’s worth of ripe tomatoes, which I then slow roast. Slow roasting is a great way to use tomatoes you’ve ripened indoors, because honestly, those aren’t the tomatoes you want raw in your salads. They do lack a certain luster that comes from being out in the sun, but they caramelize and sweeten beautifully with a few hours in the oven. 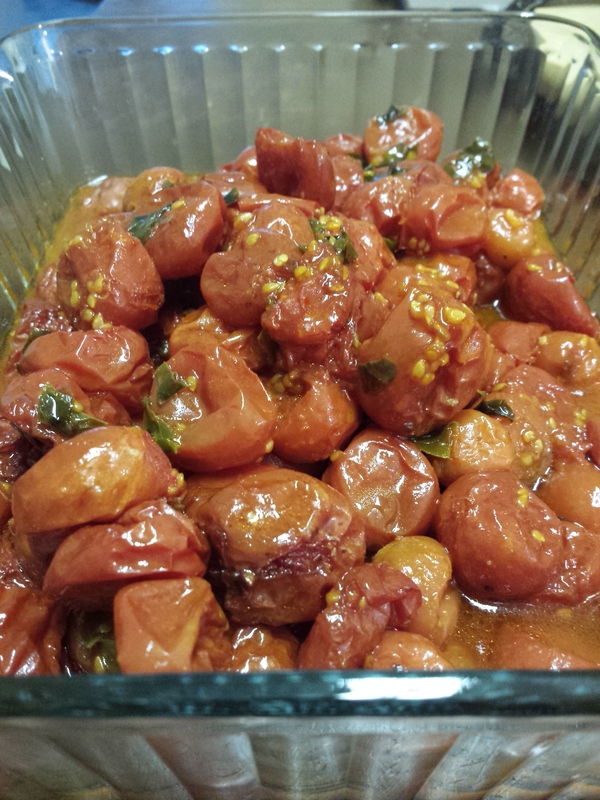 All slow-roasted tomatoes should be tossed with olive oil and sea salt to taste, but beyond that the seasoning, if you season at all, is up to you. I use the method from Molly Wizenberg‘s first book, A Homemade Life, and in the past I have used her seasoning, too, which is just a light dusting of coriander powder. It’s lovely. This year, I have been seasoning dishful upon dishful of tomatoes with fresh basil snipped from the garden and generous amounts of Aleppo pepper. It is only a mild exaggeration to say this combination has brought new meaning to my life. The above tomatoes are tossed with about a tablespoon of California olive oil (which I firmly believe in), a few pinches of celtic sea salt, a good handful of fresh, chopped basil, and if I had to guess, I’d say seven shakes of Aleppo pepper. They were left alone in a 200-degree oven for about six hours, at which time I departed from Molly’s method and turned the oven up to 350 for just under half an hour, to get a little caramelization on. I can’t think of a wrong way to pair these tomatoes, but my favorite, beyond eating them plain, is to mix them heavily into hot pasta with a clove of minced, raw garlic. They also freeze well and, upon thawing, are perfect for the base of a sauce. 04 Oct	This entry was published on October 4, 2015 at 7:46 am and is filed under Collection. Bookmark the permalink. Follow any comments here with the RSS feed for this post.